Mr. Swan in the Boston Globe! Mr. Swan super stressed and panting while being chased around Henry’s Pond. Mr. Swan Makes the Big Time in the Boston Globe! A popular swan at Henry’s Pond in Rockport managed to stay one step ahead of rescuers who were trying to capture him Tuesday. The elderly bird, known affectionately as “Mr. Swan,” has been a common sight at the pond for many years. During that time, he’s fathered many cygnets and outlived two of his mates, and led a peaceful existence on the water. But things took a turn recently when Mr. Swan hurt his leg. Although he could still swim, some people began to notice that Mr. Swan was having difficulty walking. And they began to worry. Soon enough, the Animal Rescue League was called in to help. “The swan is considered a community pet, so the goal was to capture it, have it treated, and then returned to the pond,” said Michael DeFina, a spokesman for the Animal Rescue League. While that mission sounds simple, carrying it out proved to be anything but. Catching Mr. Swan turned out to be an impossible task for the organization’s rescue team. Armed with large nets, the two rescuers — Bill Tanguay and Mark Vogel — used kayaks to pursue Mr. Swan on the water. At one point, Vogel almost caught Mr. Swan in his net, but the bird was able to break free. 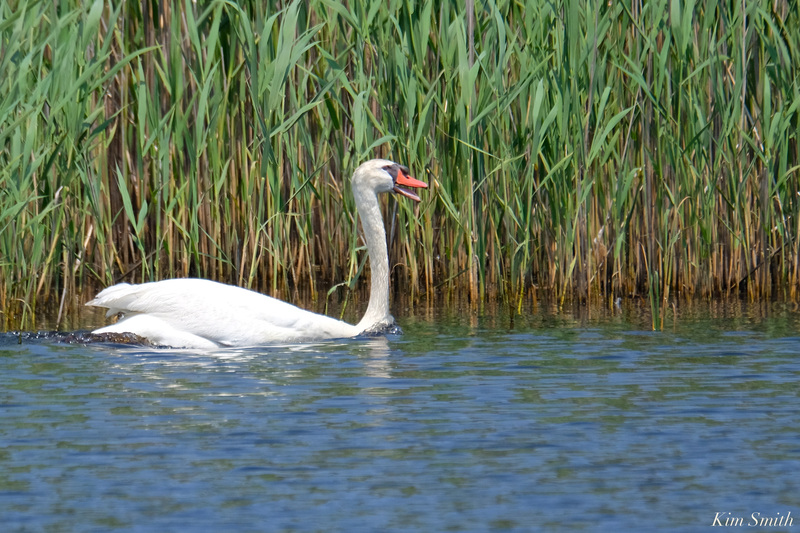 Mr. Swan eventually sought refuge in the reeds, and the rescuers decided to call off the chase. “After giving up the chase, ARL and the concerned parties agreed to continually monitor the swan’s condition, and if it worsens, ARL will be contacted to get the swan medical attention, and again, have him returned to the pond,” DeFina said. “He was chased back and forth across the pond,” she said. “He’s an amazing creature,” she said. DeFina said that the average lifespan for a swan in the wild can be about 10 to 15 years due to the hazards they can encounter (getting caught in fishing gear, getting hit by a boat, etc. ), while a swan living in a protected environment can live 20 to 30 years. “It’s clear that there are certainly people in Gloucester who care for this swan, if he’s in fact been around that long,” DeFina said. Smith said that although the Animal Rescue League’s efforts were well-intentioned, she’s happy that Mr. Swan eluded capture. “He’s lived this long, he deserves to spend his last days in his own neighborhood with his friends,” she said. Emily Sweeney can be reached atesweeney@globe.com. Follow her on Twitter@emilysweeney. This entry was posted in Birds, Birds of New England, Gloucester, Niles Pond, Rockport and tagged BOSTON GLOBE, Cygnus immutabilis, Cygnus olor, Emily Sweeney, Gloucester, Henry’s Pond, Mr. Swan, Mute Swan, Niles Pond, Rockport on June 19, 2017 by Kim Smith.